Kerala, Nov 17, 2018: Many parts of Kerala remained tense over a dawn-to-dusk shutdown called by right wing outfits after police detained a Hindu woman leader early on Saturday from the premises of the Sabarimala temple, which opened at 5 am amid heavy restrictions, causing difficulties to devotees. 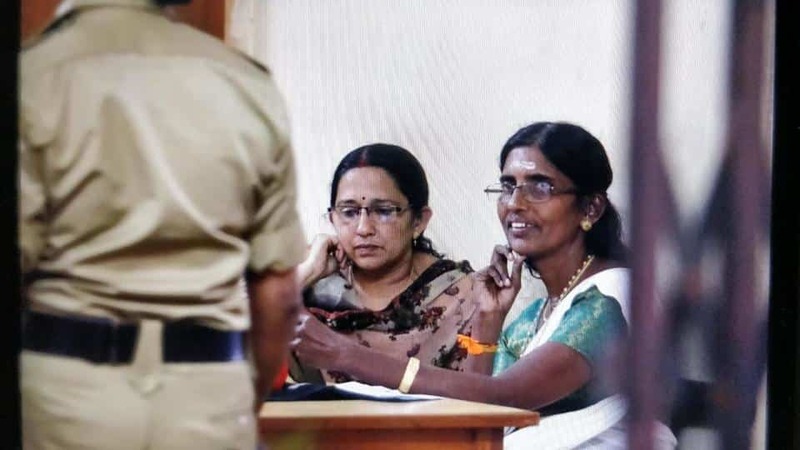 Sabarimala Karma Samiti, an umbrella organisation of outfits opposing entry of women of menstrual age into the temple called for a dawn-to-dusk shutdown in the state after Hindu Aikya Vedi state president, K P Sasikala was detained early on Saturday morning. Sasikala, who is believed to be over 50, had come for darshan to the hill top, but was stopped by police. She was taken into preventive custody at around 2 am for defying prohibitory orders. Tension gripped many areas as after fringe outfits started a campaign that Sasikala was arrested while carrying ‘Irumudi Kettu’, considered a sacrosanct offering taken by devotees to the Sabarimala shrine. Protesters defied prohibitory orders at many places. Many gheraoed Ranni police station where Sasikala is reportedly observing a fast, and demanded her immediate release. Police said she will be produced in court later. While the bandh has crippled normal life in the region, protesting leaders said it would not affect Sabarimala devotees. Unprecedented security arrangements have been made at the shrine, which opened for the third time Friday for the two-month-long pilgrimage season commencing Saturday after the Supreme Court allowed women of menstrual age to offer prayers. The temple complex and nearby areas had witnessed widespread protests after the state government decided to implement the September 28 apex court verdict. The Travancore Devasom Board (TDB), which has decided to move the Supreme Court seeking time to implement the order allowing all women’s entry, was also upset with police restrictions. Its president A Padmakumar will meet state police chief Loknath Behra regarding this. “No one was allowed to stay at the top. Neyabishekam (ritual) was affected. It is undeclared curfew,” said BJP leader K Sudhakaran. VHP state president S J R Kumar accused the Kerala government of trying to destroy the Sabarimala temple. State BJP president PS Sreedharan Pillai said the arrest of Sasikala was illegal and undemocratic. He said the Sabarimala stir will be taken to neighbouring states. The temple opened on Friday amid a standoff between women’s rights activist Trupti Desai and devotee-protesters in Kochi as she was not allowed to proceed to the temple. Police later last night booked more than 500 people for blocking Desai, who was forced to return to Pune from Kochi airport after 14 hour impasse. There were reports that she was greeted by angry protesters with Ayyappa hymns on her return to Mumbai last night. The Makaravilakku festival would be celebrated on January 14 after which the shrine will close on January 20, marking the culmination of the pilgrimage season, when lakhs of devotees are expected to throng the shrine. The Supreme Court is slated to hear petitions seeking review of its September 28 order on January 22, but has refused to stay it.